Last year, after a sponsored post about generators, we received an extraordinary number of questions from readers on the site, on Facebook, and on Twitter. So as we gear up for hurricane season this year—when homeowners are considering whether to make such an investment—we decided to go back to Reliant for answers to some of the most commonly asked questions. Will the noise from a generator upset my neighbors? Are there Homeowner Association Deed Restrictions? Generators are fairly quiet and generally quieter than your air conditioner running today. The thing to keep in mind is that the generator only produces noise when it is activated, either in an emergency situation or during its weekly test cycle to ensure systems are running properly. These cycles only take about five minutes and can be scheduled for the most convenient time for customers, often during the day when you’re at work or running errands. The cycle checks battery function, oil levels and other diagnostics to keep the engine primed and in good shape. Regarding HOA restrictions, Reliant generators typically meet all noise requirements. However, if you live in an area with stricter regulations, the company can also provide additional solutions to suppress the sound. When the power goes out, do you need to turn your generator on? This is the most frequent question the Reliant home services team receives from customers. If you have a fully automatic backup generator, these require no action on the customer’s part. The Smart Transfer Switch monitors the household’s electricity and sends a signal to activate the generator if it detects an outage. 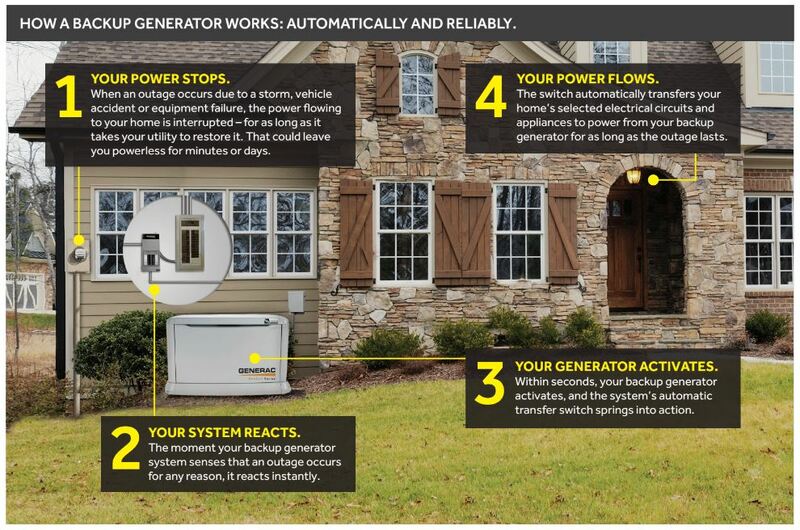 It only takes about 5-8 seconds for the generator to automatically turn on once you lose power. For non-fully automatic solutions, such as the Reliant Portable Home Power Kit, all you have to do is flip a switch and you’ll be up and running. Incrementally, what size generator will I need to power basic services, such as lights, phone, alarm system, Wi-Fi, refrigerator, etc? Reliant provides free in-home assessments, in which Reliant’s generator specialists help determine the best generator for your needs and budget. In general, 10-14 kilowatt (kW) generators are enough to run individual survival appliances, such as a refrigerator, sump pump, or lights. A 15-20 kW generator could run a small home with one AC unit, and a 21-25 kW generator could power a small to medium-sized home. Is this service available only to Reliant power customers? If so, are there any particular power plan requirements? Reliant home services, which includes generator installation and maintenance, are available to anyone in the service area, regardless of whether you’re a Reliant electricity customer! There are no specific power plan requirements to have a generator for your home. However, generators do require a steady supply of natural gas at a specific pressure to operate properly. Reliant will work with customers to ensure these arrangements are made. What are the pros and cons of a natural gas system versus one that runs on propane? We rely on generators to power us during the most critical times, so natural gas is the ideal source for generators because it is more reliable during emergencies. Propane systems are also a good solution if natural gas isn’t available, however they require more space and maintenance to keep the tanks refilled. How do generators fare in flooding? Does Reliant recommend building a structure to elevate the generator above flood waters? Generators are essentially engines, so they must bed protected from flooding. Reliant installs generators based on City of Houston rules to meet flood plain requirements. The generator specialist takes measures to provide customers a customized solution to ensure the best possible outcome. Should the generator need to be raised in order to meet requirements, a custom stainless steel platform is available with anti-vibration padding to ensure performance and noise reduction. These raised platforms can look like a deck or part of the house, or be built further away from the house. Are there smaller, more cost-effective options to a generator? For those looking for a generator alternative, the Reliant Portable Home Power Kit is a great option. The kit integrates with your home’s breaker box, keeping up to four essential circuits running when power goes out during temporary outages. As a bonus, it can be unplugged and used on camping trips, tailgating or any other time you need power on the go. Reliant can help you decide which power station is right for you. Is it difficult to maintain a generator once installed? Reliant recommends an annual service to ensure the generator is in prime condition. Their home services team is also available to inspect and maintain ANY generator installed on your property, whether or not it was originally installed by Reliant. For additional information, visit Reliant’s website for more FAQs and tips on home generators. 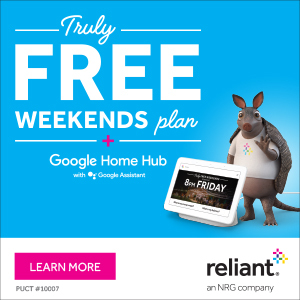 The Reliant home services team is also available to answer your questions or visit your home for a free assessment. Call 1-844-830-6084 to speak with a representative. We have one and have never regretted one moment of having it since having it installed!! Love it when a storm comes, we done have to worry or when the transformers blow we r good to go!! In doing my own research, I’m finding that, for a given generator, they often make more power when fueled with LP. Regardless, I’m inclined to go with NG for the above mentioned convenience. I have an air-cooled Generac 22KW backup generator that was installed in August 2017. “Quiet” is not a term I would use if you happen to be standing outside close to the unit. It’s far louder than my Honda lawnmower. (It does use a much bigger engine than the lawnmower.) However, inside the house it is a distant roar that is not annoying. The generator is close to the front of the house, and the bedrooms are on the other side, toward the rear, so sleeping is not a problem. If, however, you were planning an outside function while the generator is running, you better wear ear plugs. Other than the weekly checks, it came on one time in the last 10 months for a 15 minute outage. Not a big deal, but it’s nice to know that we will have power during serious outages. Be aware that these machines use a fair amount of natural gas. If running all day, it may cost as much at $50/day for gas, but I would rather pay that fee than suffer in 90+ degree heat. PS: The neighbor next to the generator has not complained about the noise. We need gasoline absolutely quiet generator combined with LiFePO4 backup battery 800 watts and inverters 120 v. 6 Amps. (2000 discharge/charge cycle), which will start and charge backup battery automatically (idle management) with noise no more then working car. This generator has to run 500 watts device (120 V, 5 Amp max) through DC to AC inverter 6 hours minimum. Is it possible to make it? What are location requirements with regards to windows, distance from walls of home, etc. The only spot I have available is rigjt next tp my A/C compressor. Any suggestions?